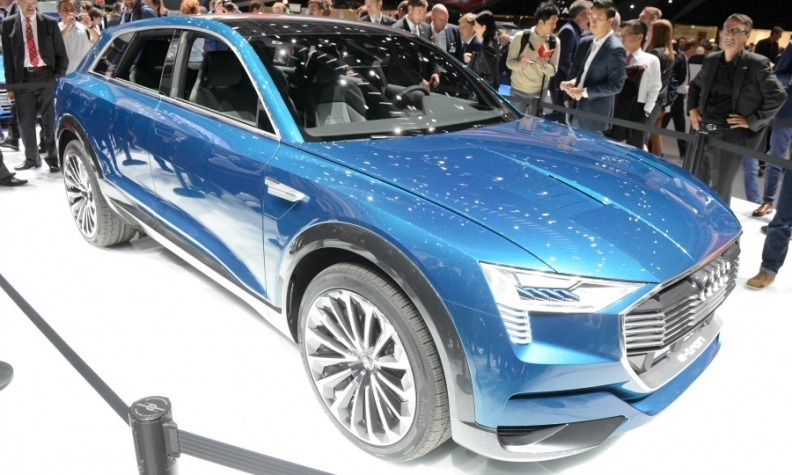 Audi plans five all-new EV models, starting in 2018 with an SUV based on the e-tron quattro concept, pictured. BERLIN -- Audi aims to cut costs by 10 billion euros ($12 billion) by 2022 to help fund a shift to electric cars as it seeks to move on after the emissions scandal that has shaken the brand and other marques at parent Volkswagen Group, sources close to the carmaker said. Audi, VW Group's main profit driver, plans to bring five new all-electric models to market in the coming years, starting with the e-tron SUV to be built starting in 2018 in Brussels. Despite run-up costs for its EV program, the automaker wants to keep its operating profit margin at 8 percent a year at least, two sources close to Audi said. Its profit margin in the first half of this year was 8.9 percent. Audi also aims to free up funds for investments in zero-emission technology by developing a new platform with Porsche, allowing both VW Group premium brands to save money by sharing components and modules. Audi is grappling with car recalls, prosecutor investigations and persistent criticism from unions and managers over the diesel-emissions scandal and its post-crisis strategy. German business daily Handelsblatt was the first to report the cost-savings target and profitability plans on Sunday.